Just got my hands on the world’s latest Bible translation of the New Testament: The Voice from Thomas Nelson Publishers – in joint production with the Ecclesia Bible Society, headed by Chris Seay. For the academics and Bible nerds out there, be warned, you’re in for a ride. The “translation committee” drew from traditional academic scholars, pastors, writers, musicians, poets, and other artists. The collaborator list includes heavyweights such as Brian McLaren and Leonard Sweet. They have the standard ivy tower theologians on the list too so that critics can be satiated, or at least rebuffed. Because of this unusual cast of characters, the final product captures your attention from the first words you read aloud (which by the way is also one of the assumptions in the writing – that it will be read aloud in public settings similar to the oral tradition of the text) whether in public worship, in more intimate bible study groups, or even when you are reading it by yourself. 16 For God expressed His love for the world in this way: He gave His only Son so that whoever believes in Him will not face everlasting destruction, but will have everlasting life. 17 Here’s the point. God didn’t send His Son into the world to judge it; instead, He is here to rescue a world headed toward certain destruction. 16 “For God so loved the world that he gave his only Son, so that everyone who believes in him may not perish but may have eternal life. 17“Indeed, God did not send the Son into the world to condemn the world, but in order that the world might be saved through him. See the difference? Personally, I found this translation refreshing. While the publisher claims it is written so that it can easily be read aloud, I really like how The Voice is attentive to the reading experience. I did not find myself re-reading parts of a chapter over and over as I do sometimes with other translations. 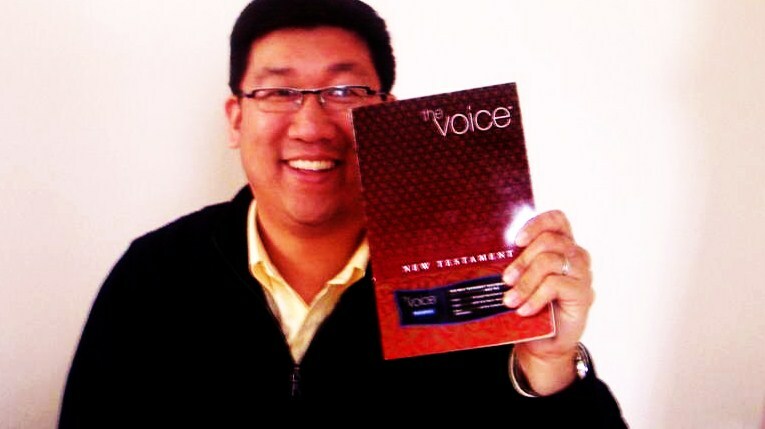 The Voice Bible which Thomas Nelson sent to me as a review copy was a paperback with heavy off-white pages. It is well laid out visually. Even though it has screen play foratting, etc, it reads really well — not one verse at a time for reference, but read — as in sit down and read the book just as if it any of your other narrative books in your library. And unlike the NIV, this translation is pretty accessible in the fact that it is available for 8 bucks on Amazon right now. (Supposedly all profits also go to missions-based activities/ministries too). If you like The Voice NT, they are working on the OT translation as we speak. In fact, you can get the [NT + Psalms + Proverbs] during the summer of 2010 (pre-orders already being taken). Is this a replacement for your NRSV, ESV or RSV Bible? Probably not just yet. But is it a dynamic voice you should add to your casual Bible study praxis or study group discussions? Definitely YES. QUESTION: What translation of the Bible do you own or carry with you? 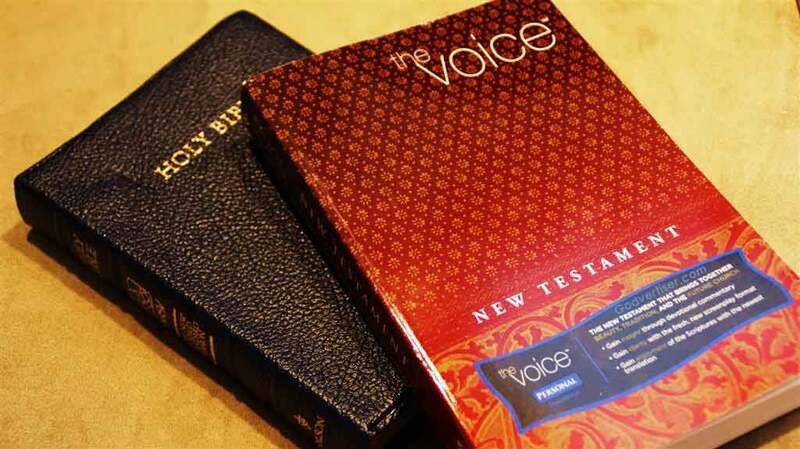 I defenitly wouldn’t carry The Voice Bible around with me, it’s so out of touch with the original Greek and Hebrew. I love the NLT and the ESV, even though they are 2 quite different translations. Sometimes having too many different translations in one language can be a problem but thank God for translations like those I’ve mentioned. The emerging church is trying to distroy God’s word little by little and this new “translation”is helping them to succeed. Look at the NIV, it was a trusted Bible translation but with the TNIV and now the new updated NIV, they are distroying a good translation in the name of political correctness. Thanks for Bible teachers like John MacArthur, John Pipper, David Jeremiah, and so on, keeping the Word of God alive and relevent for today. You say you love the NLT and yet criticize the TNIV and NIV 2011, yet the NLT has the same type of “political correctness”, it uses the gender neutral language. While the Emergent Church movement has many problems, it seeks to correct many problems that your heroes hold to. The world is different and we need to take the eternal message of the Gospel to it in a way that it will hear and understand. The Voice does so, while not perfect it is an attempt.